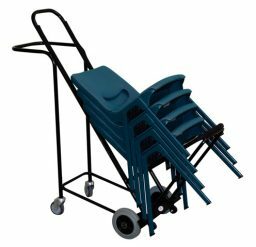 Krosstech chair trolleys are designed to make your job quicker, safer and more cost-effective –chairs become easier to move into place, quicker to set-up and a breeze to pull-down, pack and store. The Krosstech Chair trolley transport stacks of chairs easily and safely around your venue, function rooms, school hall and community centre. The Krosstech Chair trolley with stabilising outrigger is the most effective chair trolley as it hooks under the seat while stacked. Designed to keep chairs stable while they are being stacked. Depending on what style of chairs you intend to carry, this trolley can take 5-10 chairs. The Most Ergonomic and Effective Way to Move Stacked Chairs.